Roman Catholics who feel nostalgic for the way religion was practiced before the Second Vatican Council sometimes lament that "no one offers things up for the souls in Purgatory any more." It's probably true that the ordinary Catholic-on-the-street doesn't pray for the dead as much as before. Some of the reasons, however, are good ones. Catholics no longer feel as much like a beleaguered and persecuted minority, and correspondingly, have largely emerged from a supportive but rather suffocating cultural ghetto, and now feel more part of society at large. More stress has also been laid on God's love and mercy in recent years, rendering Purgatory less frightening. And modern psychology encourages people to question the need for unnecessary personal suffering rather than passively accepting it and "offering it up." But if you believe that prayer for others is a good thing, there is certainly no shortage of people who need prayer. Prayers for the dead have taken many forms over the centuries, but I was rather surprised to find that the formal, 4-decade "Rosary for the Dead" dates back only to the middle of the 1800s. According to the Basilian Fathers' website, it was invented by Abbé Serre of the Chapel of the Hôtel Dieu at Nismes, France, and promoted by the Archconfraternity of Notre Dame du Suffrage. This rosary (or more properly, chaplet) consists of 4 groups of 10 small beads: according to some traditions, these are in memory of the 40 hours Christ is thought to have spent in "Limbo" between the crucifixion and the resurrection. (A recent pronouncement from the Vatican noted that "Limbo," the resting place of the good but unbaptized dead, is now regarded as an obsolete attempt to explain God's mercy.) Between these are larger "gauds" or marker beads. In its original form, the chaplet had a medal of the Archconfraternity, representing the souls in Purgatory. On the large beads is said "Eternal rest grant unto them, O Lord, and may eternal light shine upon them." On the small beads is said, “Sweet Heart of Mary, be my salvation.” Other prayers are sometimes added. 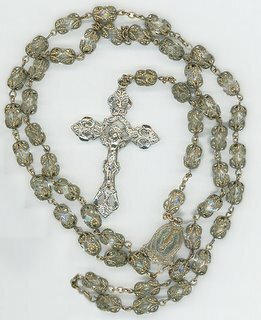 Like anything else that isn't quite standard, you sometimes find this four-decade rosary being sold on auction sites as "RARE!" or "UNIQUE." It's become less common in the last few decades, but it's still around, and if you want to add one to your rosary collection it shouldn't cost more than any other rosary of similar date.